A spread of 40 points on Bitcoin this morning at around 7:09 am! Another 40 point spread on Bitcoin at 6:30 pm on 05.09.17. Where as USD and EUR are 20 points spreads. It means a 40 point move in your direction is needed to simply breakeven! James has provided an answer to this serious issue. So there is not much IG can do about this. I may try Plus 500 to see if there are the same issues with them. I am afraid I may have to switch brokers as IG are just not meeting my needs as a customer that wants to trade Cryptocurrencies. I will have to seriously think about this. I just wanted to follow up with this. It looks like spread is back down to 20 points, but Crypto liquidity is still very, very thin. Lets take a look at a real life example below. Here is a very rough sample of liquidity on an actual crypto exchange taken a couple of moments ago. This is one of the largest Euro exchanges in the world. This is for illustrative purposes only as IG sources from a number of different providers, but it does provide clarity and a real life example. 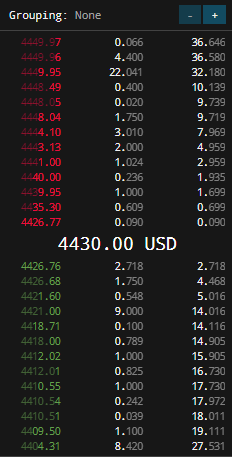 You have to remember that with IG your deal is leveraged, and therefore if you were to do the minimum size deal to BUY £2/pt on IG (which is equivalent to 2.6 BTC in the underlying market) you would clear the book from 4426 all the way to 4441, which is a 15 point spread in a single direction. If you were to BUY 1 Lot on a CFD account you would be buying the equivalent of 100 BTC (more than you can see on screen, which shows 36 coins but a degraded price of $25, or 25 points spread one way). At IG you can generally get better liquidity at a single price point, but I hope this shows that the Spread on IG is basis the actual underlying Cryptocurrency market. It is also important to remember that we have 150,000 clients and must provide exactly the same price to everyone, and often have multiple clients dealing at the same price point. So to summaries, it is just a lack of liquidity in the underlying market, and the leverage trading option which IG provide. We do appreciate your feelings on this though, and we take client sentiment on spread size very seriously, always trying to keep it as low as possible. I shall feedback to the FX and crypto desk on your behalf.